The posture and color is very beautiful. Hagi - yaki (ware) is well known as one of the production centers of Japanese pottery. These tea cups are made by Seigan Yamane who is one of the most famous potter in Hagi. The origins of Hagi yaki ware go back about 400 years. It was brought to Japan by potters returning from Korea. There was a decisive battle in 1600 in which the Lord Mori, who was protecting the Korean potters, was defeated, and subsequently moved his castle to Hagi. At this point, a kiln was opened in Hagi, and this was the starting point of Hagi yaki ware. In later times, the style was changed and diversified. One of the features of Hagi yaki ware is the feeling of softness and warmth of the soil in the finished product. It has been used mainly for tea ceremony implements, and the art has been improved and developed. Now, Hagi yaki ware is highly valued as one of the world's greatest types of earthenware. 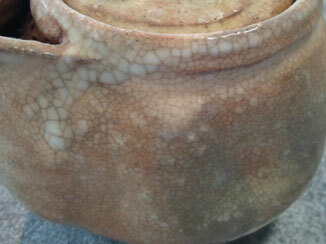 Another feature of Hagi ware is that it contains cracks, known as 'Kannyu', in its foundation. This gives it different properties of ventilation and water permeability to porcelain. Part of the charm of Hagi ware is the incrustation of tea into the cracks through use, resulting in subtle changes of pattern and color. This is the reason that Hagi ware is respected, and the respect is demonstrated in ancient sayings originating from the world of tea earthenware such as, 'one Raku, two Hagi, three Karatsu', and 'The seven changes of Hagi'. Another element of the charm of Hagi yaki ware is that it gives a feeling of amorousness combined with simplicity. Moreover, the shade will change gradually through use. Enjoy this transformation, and feel the softness and warmth in your hand. - Sample Kannyu - It add an extra touch when you use it for a long time. A brand-new, Price is included two different size of tea cups. What a fantastic store! The pottery is haven. If you're green tea enthusiast this site will amaze you. If you have any questions they will be answered. The prices seems to be high especially because of the shipping prices but I think it's worth it. 0 of 1 viewers said this review is helpful.